Back in the early 90s the Arcade Attack crew would rush home from school, switch to CITV and enjoy the latest helping of Bad Influence! We are delighted and very thankful to have interviewed one the main hosts from that quality show – Andy Crane! He has worked on numerous TV and radio shows including Top of the Pops, Motormouth and from the famous Children’s BBC broom cupboard. He currently reads the news for ITV Granada and does radio shows for BBC Manchester and Sheffield. The aforementioned Bad Influence! 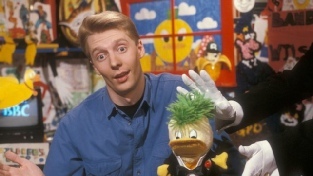 was broadcast on CITV for four series and was easily one the most popular children’s shows of the time. Question 1 – Bad Influence was a huge commercial success. What was it like to be part of such a ground-breaking and popular show dedicated to gaming? Great fun – but do remember it wasn’t just gaming, Bad Influence was just as much a technology show. When the computers that controlled one of the big rides at Blackpool pleasure beach went wrong we did a film on why and how it was mended. Question 2 – What is your fondest memory of working on Bad Influence? The people – Violet and Andy (Nam) of course – but the team too. Everybody who worked on the show was so professional and terrific company. To this day I remain good friends with the producer Patrick. Question 3 – Your co-presenter Violet Berlin famously managed to get a playable character into Micro Machines 2 during her time with Bad Influence. Did you ever get the opportunity to get yourself into a video game and if not did this upset you? Question 4 – Bad Influence lasted for four successful series. How did you feel when you found out the show would not be re-commissioned? Disappointed of course but that’s the nature of TV. We had had four series and bosses felt it had run its course. Question 5 – Have you always been a gamer? No – I never really was and I’m not now really. That was very much Violets area of expertise. I enjoyed playing of course, but I was primarily employed for my presenting and communication skills. There were far better gamers than me working on the show – I got most of my information from them. Question 6 – What is your favourite video game of all time? Don’t really have a fave – but I always enjoyed Super Mario and Super Mario Kart. Question 7 – Do you still play video games today? Not really – the odd retro one online occasionally but not often. Question 8 – Do you feel there is a current gap in the market for a TV show dedicated to the video game industry? There is probably so much online these days that a mainstream TV show is unnecessary. Tech is also well covered by Click and Swipe on BBC and Sky News respectively. Question 9 – If you could share a few pints with a video game character who would you choose? Can’t say I’ve ever given that any thought and I probably don’t know enough to make a sensible choice so I shan’t bother. Question 10 – What are you currently involved in at the moment? Much the same as I always was but for different audiences. I do radio for the BBC in Manchester and Sheffield –read the news on ITV Granada and host corporate conferences and awards ceremonies for whoever will have me!